With all the activity of the War production, no serious thought had been given to what products the company should be concentrating on once peace was restored. Everyone just assumed that things would quickly go back to the pre-war state. It soon became apparent that this was not to be so. Hundreds of men were returning home to the ‘Land fit for Heroes’, looking to take up their old jobs. Their jobs were already occupied by someone else and they were having problems hanging on to them. All government war contracts were cancelled almost overnight and the state of the export market was totally depressed where it even existed. Many counties around the world had similar problems and quickly became isolationist to trade, particularly the USA and British dominions. By 1921 the company reported its worst trading year in ‘living memory’. The company was restructured and in compliance with Company House rules changed its name to ‘W H Allen and Sons Ltd’. Nearly all the women employed during the war and some men were laid off and wage reductions were considered. The company struggled along for the next 12 years picking up small contracts where it could. A number of licence agreements were entered into to try to widen their scope. Forays into uncharted water were taken in the hope that it might improve their situation. One of these forays involved Allen diesels in railway locomotives. 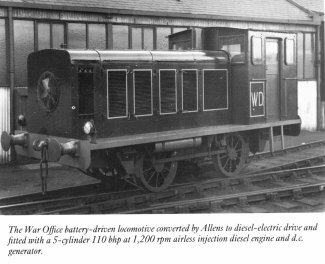 The War Department commissioned the conversion of one of their battery driven shunting locomotives to diesel power. This work was carried out at Bedford with a five cylinder 110hp engine running at 1200 rpm direct coupled to a dc generator. This loco ran for many years at the WD range at Shoeburyness. 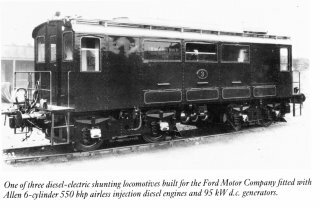 BTH in Rugby placed an order for three Bo-Bo diesel electric shunting locos for the Ford Motor Company.They were to be the first All British standard gauge diesel electric locos ordered by an industrial concern in the UK. 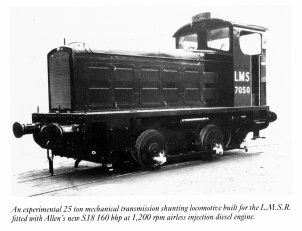 With a top speed of 35 mph and weighing 44 tons they had a drawbar pull of 24,000 lbs produced by their 6 cylinder Allen 550hp diesel engine driving a generator coupled to four traction motors. One of these survives in working order on the Kent & East Sussex Railway at Tenterden in Kent. The third loco was the result of a design competition by the LMS in 1934 between Hunslet, Armstrong Whitworth, Harland and Wolf, Hudswell Clarke and Drewry. An order for an 0-4-0 diesel mechanical shunting loco was placed with Drewry. An Allen 8 cylinder engine of 160 bhp was used. Armstrong Whitworth won the day with a diesel electric loco using a Sulzer Engine. The Drewry loco, LMS number 7050 (wikipedia page), was placed on loan to the Air Ministry and sold to the War Office in 1943. The engine, which was a prototype, was not very reliable and after throwing a fourth connecting rod was replaced in 1943 with a Gardiner engine. 7050 survives today in the National Railway Museum in York, but not with the Allen engine. No further loco projects were undertaken thereafter. Another line of interest was the building of diesel generators for private yachts. 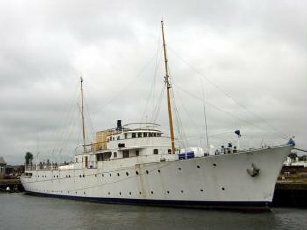 The first of these, in 1933, was for the yacht ‘Trenora’ being built by Thornycrofts. This yacht was ordered by a ‘distinguished English Surgeon in Paris’ named Mr Gerald Stanley. He ordered it to provide work for British shipworkers during a period of depression. 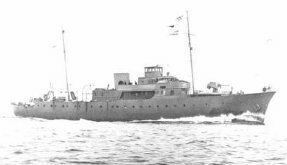 The yacht was built to a high degree of luxury, but in 1940 it joined the Canadian navy as ‘HMCS Sans Peur’ (Fearless) (more info) and was fitted out as an Armed Yacht with a 4” gun on the foredeck. "HMCS Sans Peur" ("Fearless") - built in 1933 as "Trenora"
"Norge" (in 2004) - built in 1936 as "Philante"
In 1936 Allens provided diesel generating sets for Tommy Sopwith’s yacht ‘Philante’ built by Camper and Nicholson. This had to be particularly quiet and vibration free, as the units were installed directly under the owner’s stateroom. 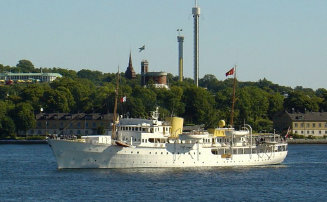 After serving in the Royal Navy during the Second World War as ‘HMS Philante’ the yacht was sold to the King of Norway and became the Norwegian Royal Yacht ‘Norge’. The yacht survives today as ‘2004’ photo shows. 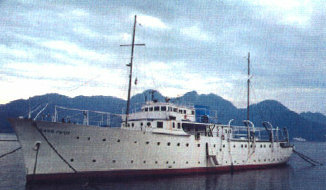 A third yacht order in 1937 was for the infamous yacht ‘Shemara’ owned by Sir Bernard and Lady Docker, famous for their public displays of oppulance in the nineteen fifties. This yacht was almost the same as the ‘Trenora’ and currently belongs to Harry Hyams, the property developer of Centre Point fame, and is currently (?) laid up in Lowestoft and there are rumours that she is to be restored to former grandure. Although only a few yacht sets were built, they were at least noteable ones. In 1933 it was decided to move all production at Biddenham Works back to Queens and half of the site was sold for housing in 1937. Things started to improve in 1933 as the country started to come out of recession. Production in 1933 was double that of 1932; by 1935 it was five times the 1932 level. In 1934 the Navy again started to plan for improvements in its ships and noise reduction of equipment became paramount. Much of the companies effort went into winning orders in the commercial world. This involved pumping stations and power generation as well as generating sets for the maritime market. One of the largest orders at this time was for the Metropolitan water board’s new pumping station near Hampton Court. In 1935 ‘secret orders’ were received from the Admiralty and a full scale re-armament programme got under way. The company was very soon building up the volume of War Department work for the Navy.